Catalan authorities will not follow orders from the Spanish government if Madrid moves to reassert control over the region, a senior official says. A regional government spokesman told the BBC that the central government was acting against the will of Catalans. Spanish Prime Minister Mariano Rajoy has announced plans to sack the region's government and curtail some of the powers of its parliament. The Catalan parliament will meet on Thursday to decide on its response. The pro-independence leaders could decide to formalise a unilateral declaration of independence, the BBC's Bethany Bell in Barcelona reports. The Spanish Senate is expected to approve the government's measures on Friday along with a proposal for fresh regional elections. 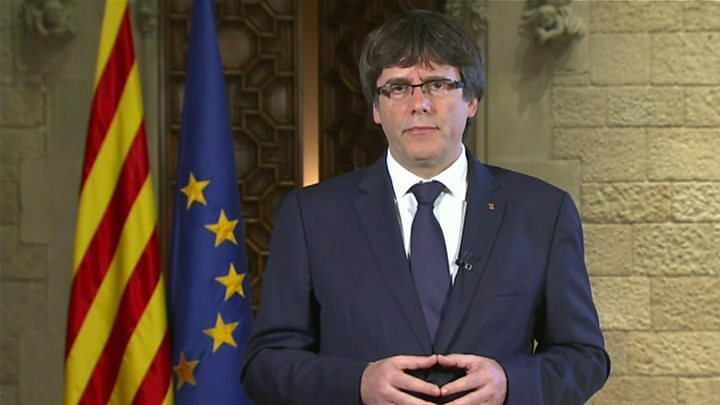 The Catalan government, led by President Carles Puigdemont, has refused to halt an independence drive following an outlawed referendum held earlier this month. 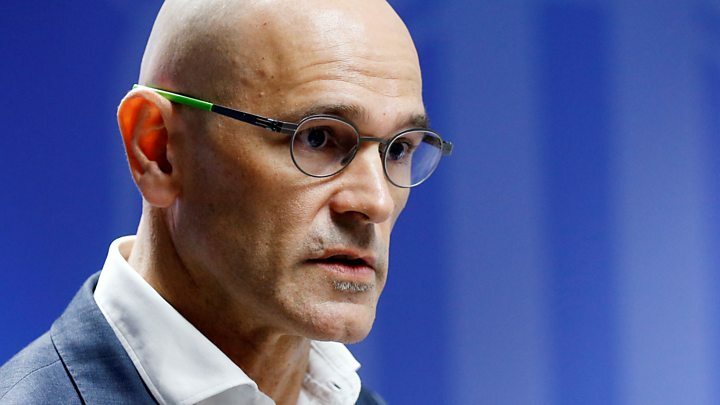 Media captionRaul Romeva says direct Spanish rule would put into question the survival of "EU democracy"
On Saturday, Mr Rajoy said he was triggering Article 155 of the constitution - an unprecedented move - which allows for direct rule to be imposed in a crisis on any of the country's autonomous regions. But Catalan leaders say they will not accept the plan. Speaking to BBC Radio 4's Today programme, foreign affairs spokesman Raul Romeva said: "How can the European Union live with that situation [if this happens]? "Because what I can tell you is that the people and the institutions in Catalonia will not let this happen." He said the Spanish government needed to recognise that the people of the region had voted for independence. The Catalan government said that of the 43% who took part in the 1 October referendum, 90% were in favour of independence. Unionist parties who won about 40% of the vote at the 2015 Catalan elections boycotted the ballot. 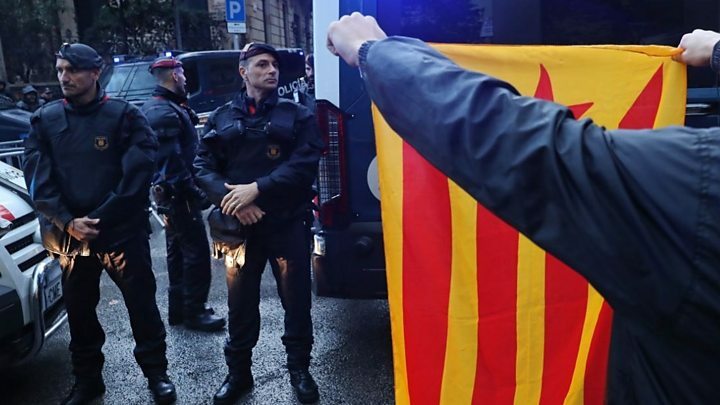 Apart from stripping Mr Puigdemont of all his powers, the central government will also seek to take control of Catalonia's police force and its public broadcaster, TV3, reports suggest. Mr Rajoy insisted the measures would not mean Catalan self-government itself was being suspended and that they were intended to remove the people who had taken illegal action. The country's Deputy Prime Minister, Soraya Sáenz de Santamaría, told Spanish radio Onda Cero (in Spanish) that Catalan leaders were "completely not in compliance with the constitution and the statute of autonomy". Reality Check: Would Catalonia be a viable country? Once the Senate approves Article 155, Mr Puigdemont will stop receiving a salary and will not be able to carry out his functions, she added. Catalonia's far-left CUP party - a key support for Mr Puigdemont's minority government in the regional parliament - has warned of a campaign of "massive civil disobedience" if Madrid imposes direct rule on the region. Spanish media report that the Catalan leader is planning to present his arguments to a commission of the Spanish Senate on Wednesday, but this has yet to be confirmed. There have been calls by Mr Puigdemont's supporters to declare a snap election before direct rule becomes effective. The EU has refused to back the drive for Catalan independence and said the crisis was for Spain to resolve. Would Catalonia be a viable country? Do Catalans want to leave Spain?